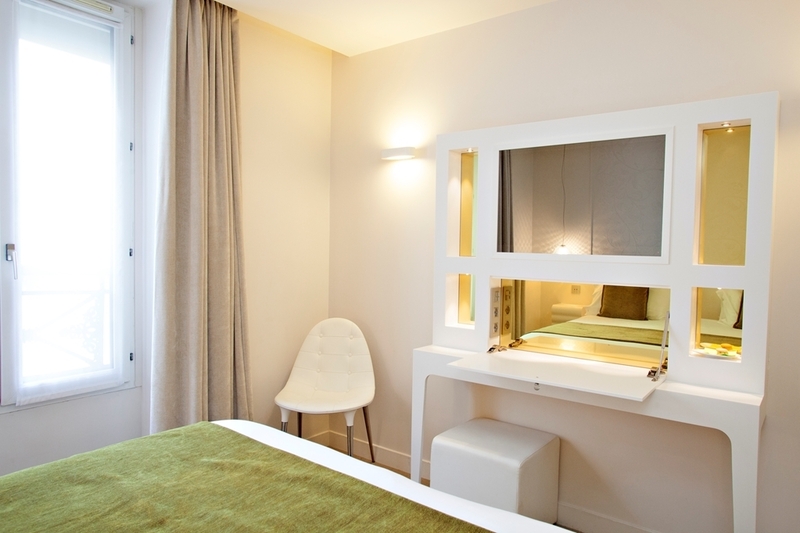 The Best Western Plus Elysee Secret is ideally located in the center of Paris. Come and experience our hotel near the major tourist attractions. Best price guaranteed and exclusive deals. 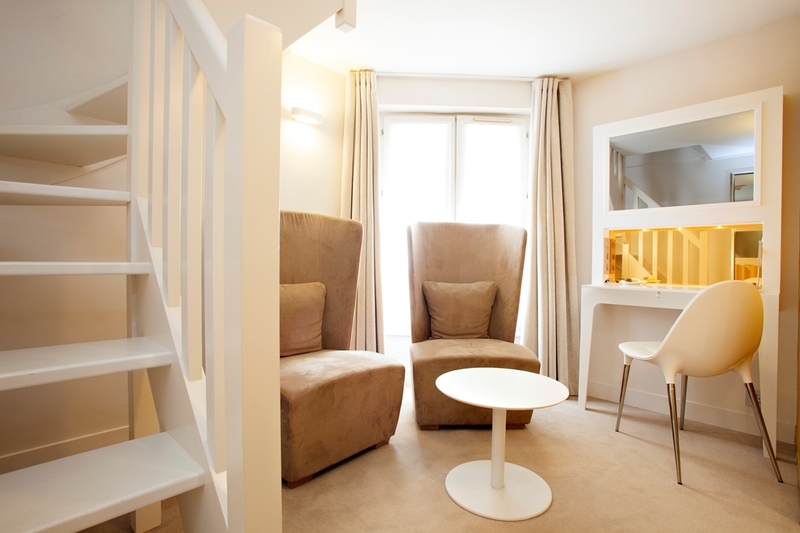 A stone's throw from the Champs-Elysees on a smaller street lined with shops that hosts a lively night scene, the Best Western Plus® Elysee Secret provides the ideal location to discover all that Paris 8th and 7th arrondissements have to offer. Near the capital's largest museums, this hotel of which the intimate decoration is based upon Marie Antoinette's contemporary boudoir, is a select place for basing a cultural stay in Paris, with outings to the Grand and Petit Palais, Guimet Museum, Cite de l'Architecture and Palais de Tokyo all in the immediate vicinity, without overlooking the Hotel des Invalides and Quai Branly Museum across the Seine. For shopping and nightlife, the avenue des Champs Elysees just a few hundred meters away abounds in luxury shops and popular clubs like the very trendy Regine's Club. A warm welcome, staff very attentionate. Free minibar, lovely view on the roofs, lots of light and a small balcony (I could not access the balcony because of a technical problem but I have spontaneously been given a discount for this. Not a lot of space for the clothes. 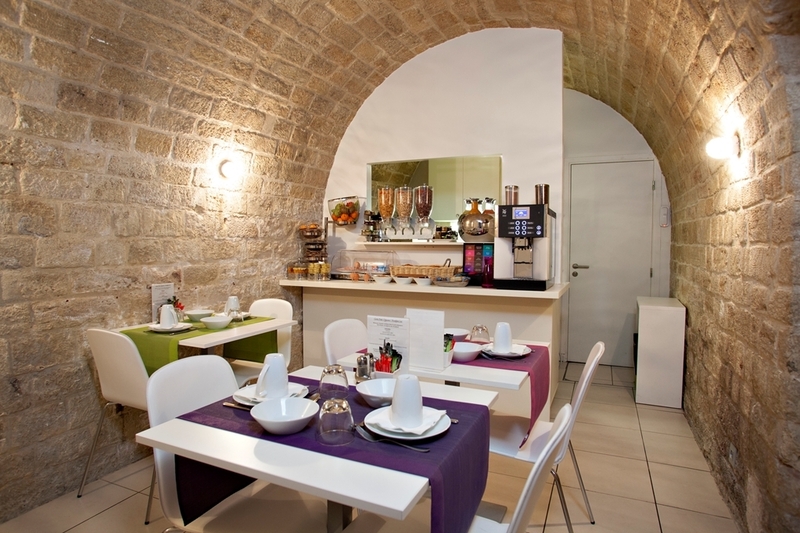 Small breakfast area without windows but in a nice vaulted cellar. Friendly service. Good clean hotel although a little compact. Wouldn't want to spend longer than a couple of days here. The rooms are very compact and the lift is an experience in its self!!! Perfect location though enabling you to walk around the local sites. Good value for money as not very expensive. Don't bother with the breakfast here take yourself out to any of the local restaurants nearby. "Little pigeon but great bed to sleep "
First u found this is small and tiny but u would realize the room size is reasonable and the whole place is quite cosy, and very confortable bed and linens! Location is quite nice and you can access to both side of Champs-Élysée evenue either to the right or left. Lots of eateries and pubs around. The hotel staffs are very friendly and helpful. They have even provided a little lounge for your meeting and even waiting at 2nd floor, with drinks and fruits served on the bar! Will be back again! "Sauna conditions with rocks for beds"
Got here over the weekend, booked for 5 days. Barely made it through two because because during a heat wave, they wouldn't turn on the AC. I tried to sleep with the window open, but it was so noisy - I had no choice. Tiny rooms, rock-hard beds. I tried to leave early, but they said they'd penalize me. They finally turned on the AC because so many complained. If you like saunas and like to sleep on bricks, this place is for you. If not, go somewhere else. Great location, and a very helpful, friendly staff. Rooms are clean, well-maintained. It's just a short walk from the river, museums, some really good restaurants. About a 20 minute walk to the Eiffel Tower. I would not hesitate to stay here again. "Great hotel with a good price in Champs Èlysèes"
We stayed at this hotel for three nights in August and we are very pleased at our stay. Hotels in Champs Èlysèes are usually expensive and this hotel didn't only have a great price but it was also worth the price. The location was absolutely great, a two minute walk to the famous street of champs èlysèes. Close to the metro station Franklin D. Roosevelt in Champs Èlysèes. The staff on the hotel were unbelievably helpful and nice. They upgraded my room because it was my birthday which was very nice of the staff to do. If you want to stay in Champs Èlysèes but not for a expensive price, this is the best hotel for you! Ok so let's get the simple fact of how tiny this hotel is out of the way. It is small. The entrance way is small, the steps are small, the rooms are small, the lift is small. But in all other respects, this is a pretty good hotel. I was in the smallest room in the house but whilst it overlooked a brick wall, it didn't feel cramped as it was well appointed and little touches such as free mini bar, coffee, good toiletries and plenty of storage made the stay fine. The staff were really good - my only slight whinge was going at 21.45 to see if it was possible to get room service. I was told it was too late (even though the hotel details say that it is available until 22.00) which was disappointing. Apart from that, I would recommend, not least for the excellent position. I would stress that I could not see any step free access, even to the lift, and given the smallness of rooms this is probably not a great hotel for people with limited mobility. "Good location but not a lot else to recommend"
I was booked here for one night on business when our usual hotel was fully booked. Could not argue against the location - 2 minutes from our office with bars and restaurants all around. But apart from that there were some good points but also some not so good. Good points: - quiet room - modern bathroom with decent toiletries - mini-bar with free soft drinks - decent cold breakfast selection Bad points: - room small with window facing another very close wall with pigeons inhabiting the small space inbetween - only one small bedside table (on the wrong side of the bed for me) - no bath, only shower - no proper kettle for making tea, only an old hot water machine which dribbled out lukewarm water - given wi-fi code but it didn't work and had to call down to reception for a different one - no hot items at breakfast unless you asked for them Finally, when checking in the receptionist wasn't sure at first if I had breakfast included or not but finally decided I didn't. I had breakfast but on checking out I wasn't charged for it. I don't know if they decided it was included after all or they just forgot to charge me for it!! Definitely more 3 star than 4 star, I won't be rushing back when there are much better 4 star options in the area. Nice little hotel, reception, rooms, lift etc are all are indeed very small, but it wasn't a problem for me. 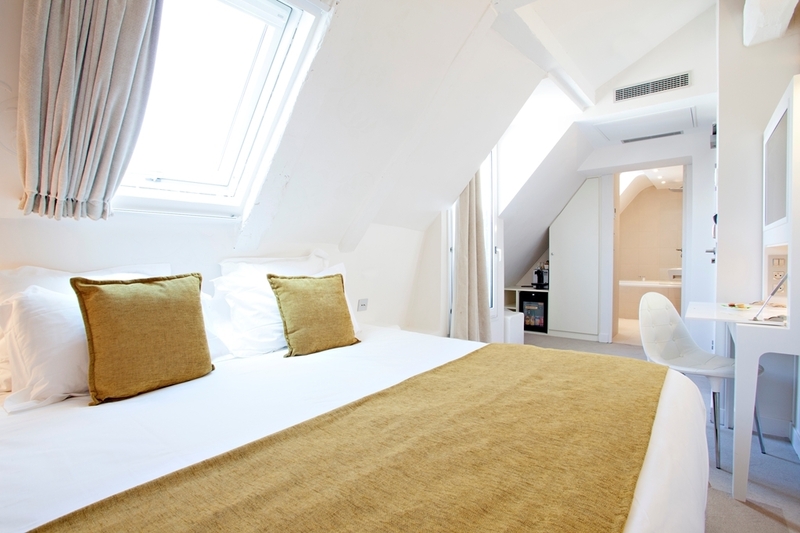 Location is great, with the metro nearby, and a very short walk to restaurants and Champs Elysee. The room was clean and bright, really couldn't ask for more. The room was comfortable, quiet and clean. Exactly what I needed! The breakfast was very good, with fresh croissants and a good variety of juices, cofees, cereals, yogurt, cheese, ham, pastries, bacon and eggs if you asked for. Will probably return on holiday. "DEFINITELY NOT A 4 STAR HOTEL." The first incredible thing that struck me was when I was requested to leave a 50€ cash guarantee by the receptionnist. Although she had my credit card details, she insisted on this procedure. Her colleague, the next day on checkout, could not believe this story and I had to show a receipt I fortunately had insisted to be given the day before in exchange of my 50€ note, to get them back. This is just not acceptable! Second was the size of the lift which is certainly the tiniest I have ever seen. You have to choose either to fit two (medium size) people without luggage or one with. Then we found out that our room (too small for a 4 star hotel) had a window opening on a blind wall two meters away as well as to a massive scaffolding that was obviously home to several families of pigeons. And finally the breakfast room! Be prepared for a breakfast room smaller than a bedroom, capable of receiving 8 people only when the hotel with 26 rooms can potentially host 52 of them. The buffet is not of the level of a 4 star and you want to leave this room as quickly as possible (which makes room for the people waiting, obviously). The sole quality of this hotel is its fantastic location. Period. How they manage to put a hotel in to a small building is a Paris specialty - and the Best Western Plus is one of them. Tiny reception area, and that is the general at this hotel. But actually the rooms are okay in size, still tiny, but well maintained. Forget the breakfast buffet, it's way to expensive and nothing impressive. Go around the corner and take the breakfast there. All in all a great hotel. This hotel is in a great location just off the Champs Elysee and not far from the Place de la Concorde. There are no public areas in the hotel and reception is tiny. 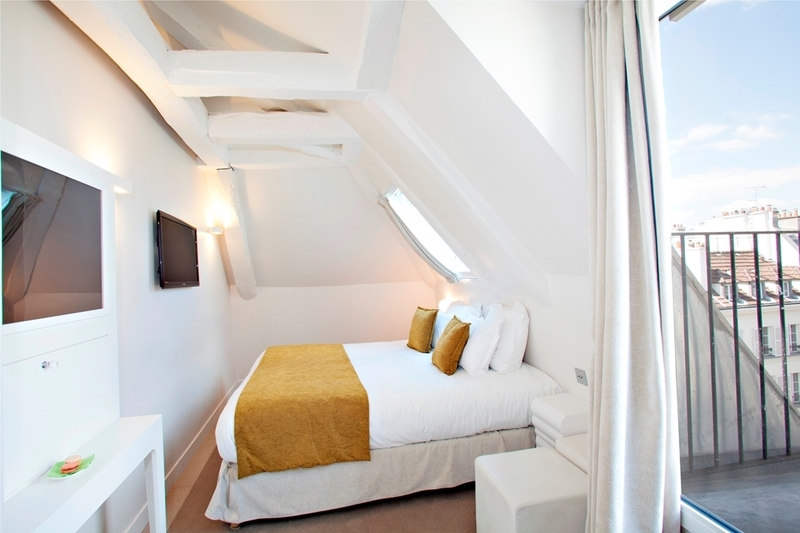 The rooms are split over 6 floors and are stylish yet compact. Beds are comfortable but unfortunately when I was there they had turned off the air con since it was Autumn, so room was a bit warm for me, although you can open the windows bearing in mind it is the city centre! Bathroom is stylish too. There is a nespresso machine and a fridge with soft drinks and crisps which are complimentary and a nice touch. Unfortunately I had a problem with my safe when I was there which was sorted eventually. Breakfast is served in a tiny room in the basement and offers a decent selection. As it is the city centre there are loads of restaurants, bars and cafes within easy walking distance on the Champs Elsysee or smaller streets around the hotel. The hotel is a little bit older, the room was small but very clean. 10 points for location. and 10 point for the night receptionist, was very helpful and kind. I wll be back here for sure. The hotel is on a quiet street and in same time very close to champs elysee. We planned our romantic vacation and booked a suite at the hotel. But the hotel without informing us using this room to other people. We did not get any apology and were placed in another room. Incredible!!! "Tiny hotel in Paris most expensive area"
We booked this hotel at very last minute because we were doubting whether we'd still go to Paris or not. The weather in January was not at its best and taking a small child gave us not a good feeling about it. We got a very good deal no breakfast included. When we arrived in the hotel which was easy to find, we were very surprised that it has a very small front desk, and very small lift. It could only fit 2-3 pers I guess. But the room was lovely, although was also very small, but the bathroom was big enough. We enjoyed our stay there but we will not stay at this hotel again if we ever visit Paris in the future. We have a kid and he needs some space to move and it isn't possible in this hotel. "Tiny Tiny Hotel - but great location!" We had a long 4 day weekend in Paris and stayed here. Given the pictures and the Best Western reputation, we thought it would be great. Location is indeed super close to the Champs Elysee - worth it from this perspective, however only this! Took us a while to find the hotel, and when we did we were greeted by a small glass slide door, a tiny reception and a confused receptionist. Our room was on the top floor, "best one" she said, however I would be curious if ours was the best how were the rest. The elevator is tiny tiny - can only fit 1 person and a suitcase. When entering the room I was surprised it was a duplex: bathroom with 2 armchairs and a vanity on the bottom and the bed with a luggage storage space upstairs. There was also a built in small wardrobe on the bottom, that had the safe box too and a tiny minibar. Some chips bags were thrown on the bottom of the wardrobe for us as "part" of the minibar. The bed was comfy - however the stairs to get to it were steep and it was impossible to get any suitcase up. If it was dark, it was super easy to step wrong and fall. Bathroom on the other hand was very nice, had everything and was nicely spaced. Breakfast was dreadful (sorry to say it but it's true). It's at -1 (basement), 3 tables and that's it - you need to wait for others to be done. Not that much selection - if you're lucky you find something available - omelette you get on order which tasted good, but good luck having some bread left to eat it with. Resources are slim here. Had an issue with the room key - it demagnetised and it took me 3 trips downstairs to get somebody to actually replace it instead of just "Re-activating it", which clearly didn't work. I honestly wouldn't recommended unless you aren't picky about small rooms, no breakfast and want an amazing location, close to the metro, good restaurants and shops. Spent 3 nights here over the Tour de France weekend, and was exactly what we were looking for! 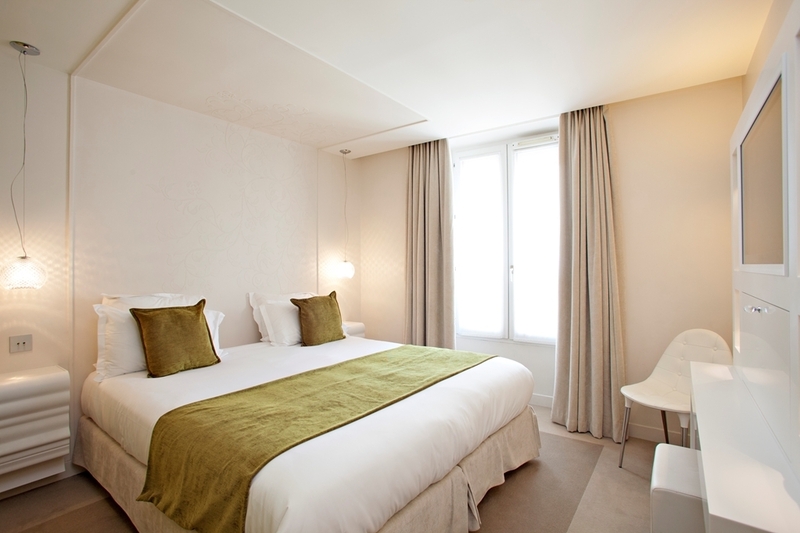 Close to the champs elysee for easy access to the racing but also walking distance to many other tourist locations! Room is small- but we spent minimum time in the room, but we were allowed to check in at 11am instead of 3pm which was a god send after our flight getting in at 8am! Air conditioning unit worked a treat- and being on the 6th floor we had no noise at all. Lift was always available if we needed it, and can't complain about how small it was when you look at the hotel! Reception were very friendly, but special shout out to the gentleman who was on evening on 23/7- you were a great help to us and even offering to call us a taxi. Great stay, and if we were to return for the cycling- we would certainly look at returning there! This is the smallest, worst hotel we've stayed in for years. Everything is tiny, tiny,tiny. The staff are simply 'working a job' and are not interested in customers. Included in our room rate was 'Hot American breakfast' for 19 euros which consists of old cereal, patchy fruit and occasional boiled eggs. On our second day here they simply said 'we have no eggs today'. You can get twice as much for half this price across the road and it's fresh. Their E19 breakfast is a rip off and false advertising.The staff who work here are unhelpful and some know little about this hotel. The reviews of this hotel praise it as 'central to everything'. If you're expecting the romantic dream of the 'old Paris Champs-Elysées' forget it. The area is full of beggars, refugees, con artists, gangs and there are NO French people - mostly Africans, Middle Easterners and Asians all paying for over-priced stuff in the shops. Machine gun police are everywhere and even the Disney Store has armed security. We walked at 6am this morning and people were peeing and pooping everywhere. So basically you are close to everything you don't want. We definitely won't be back to Champs Elysees or Best Western. My wife and I recently stayed here for our very first time in Paris. We were warmly greeted by the front desk clerk and were even allowed to check in early. We quickly crashed for a nap because were exhausted from the flight over. It was pretty warm in our room the first night. The hotel climate is either set to warm or cool. There's no controlling the temperature in your room. But, the rest of our stay was very comfortable as the management set the temp to cool. I had trouble with the wifi our first night but was graciously helped by the desk clerk to get my phone to connect to their wifi. The rest of the week was great. And without question I cannot say enough about Najib. His warm and genuinely caring nature made us feel right at home. He was very helpful in our attempts to learn some of the language plus just an all around great guy. He's definitely an asset to the hotel. I would definitely stay here given the opportunity. Small frontage, small lift, tight room, but good location. Don't expect much in terms of amenities or even toiletries. No body soap or shampoo provided. Front desk said it was because of problems with the supplier which happen to be during my stay. How coincidental, and that honestly happens to hotel chains? Great location! Outstanding!. Small room, when I arrived at 8:30 pm my room was not ready and I need to wait. Maybe for fast service to deliver, forgot towels and personal care things. It is good for one or two nights. We stayed here for 4 nights over Easter (room 501). Admittedly this hotel is very, very small! However, having read the other reviews, we were already prepared for this. Despite being small, they have utilised the space quite well. 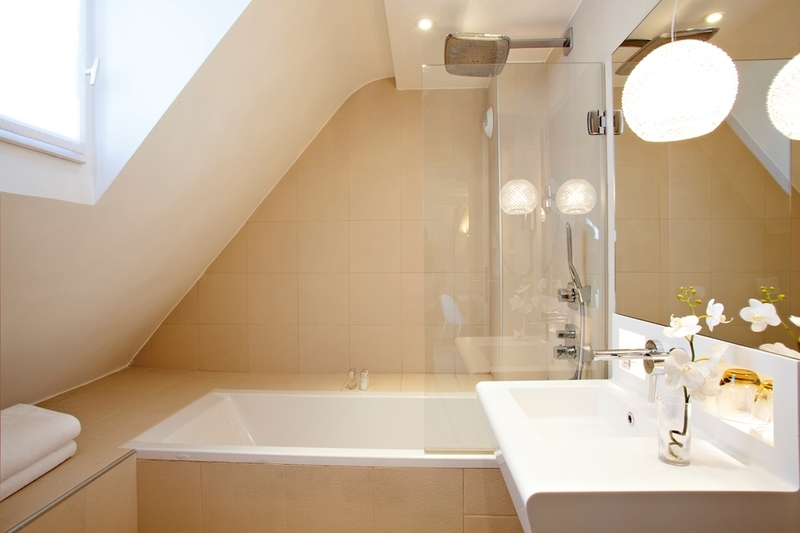 The bathroom, which for me is the most important feature, was comfortably spacious. The rainfall shower was amazing! Free WiFi with good speed (around 4 Mbps). VERY good location, just minutes from Champs Elysées, and also within walking distance of the city centre. There were some negatives, though. The TV is locked behind a glass cabinet, so you can't access its USB or HDMI ports. This was inconvenient as we couldn't use our Chromecast. Also, we had an issue with the locker. The batteries ran out while our stuff was locked inside, and it wouldn't open. There was no one on site who could fix this, so we had to wait until the next morning, causing us a lot of inconvenience. I wouldn't blame the hotel entirely for this, as this was a case of bad luck. However, they do share some of the blame as they should have kept the batteries in good order and should have had someone on site who could fix it. Other than that it was a comfortable stay. "Smallest room I've ever had"
Stayed here in March 2017, client company booked us in. My colleague booked two nights as he wanted to check in very early from an overnight flight, I arrived late in the evening checking in just before midnight, the hotel had been warned I'd arrive late. The hotel is well located but absolutely tiny, almost Lilliputian. Check in desk/lobby is about the size of a counter at a dry cleaners. The lift barely carries one person and suitcase. I had room 602, on top floor, and the sloping roof meant I could only stand up on one side of the room. The bed filled the room. The wardrobe was a cupboard I original thought contained an electricity meter - on opening it I discovered some hangers, but the whole unit was half the height of the wall. My jacket would have draped on the floor had I used it. I'm six foot one, and could probably have stretched out in bed and touched both walls. The shower was too short for me, by about four inches, and I had to duck to get under it. The room smelt as if it was a smoking room, and my colleague reported his room on the third floor was taller, but no bigger, and not clean. We checked out and didn't take breakfast, as the breakfast room was too small for us to chat and work in. In total these three nights cost us over €500. We'll be recommending to our client that they don't book this hotel again. Scoring for location only - avoid otherwise. Stayed at the Best Western Elysee Secret for business. Without doubt the hotel is in a fantastic location (within walking distance of all the sites!) but my room was small (even for Paris standards!). The staff were always friendly and helpful (and will recommend local places to eat). I think the hotel needs an upgrade (it feels a bit tired) but it more than makes up for everything by its location. We stayed in this hotel for 3 nights in April 2016. The rooms are not that large, but they were clean! We had a "suite" with a queen bed. The room was on the top floor and had a slanted ceiling, which was interesting! We weren't expecting US size rooms, so it was fine, and it was what we were expecting. The room had a very nice nesspresso machine and a small fridge. The people who worked at the hotel were very nice and helpful. The breakfast area is very small, and the breakfast they serve is cereals and croissants, etc., but it wasn't expensive either. There is a lift, but it is very small! Only big enough for one of us to fit in when we brought our big suitcases to and from our room! :-) There is also a skinny spiral staircase that we used to walk up and down. There's a small sitting room on the second floor that had another nesspresso machine and different flavored pods (and I'm pretty sure free sodas were in there as well). There is not a lot of space, but we didn't expect a lot of space considering the location. So talking about location, the hotel is in a GREAT location! It's just a block off the Champs Elysee with tons of shopping and restaurants within a very short walking distance. It was just a few minute walk to the Roosevelt metro station. We walked from the hotel to the Louvre on one end and l'arc de triomphe on the other end (it was a lot of walking, but very doable for folks who like to walk). We were very happy with the hotel, and especially with the location! The staff were friendly and helpful. As staying in Paris and for such a price, the hotel room was not spacious as expected. But it's a nice location for either go for sight-seeing or heading to shopping. There was an elevator which was essential for us as we had three large luggages and one small luggage when we left. And just below the hotel, there were pizza, burger, pastries and Japanese food/restaurants. All in all, this hotel is great for its price and at a very convenient spot. This experience gives me thought about including this brand as my choice of accommodation in my next trips consideration. 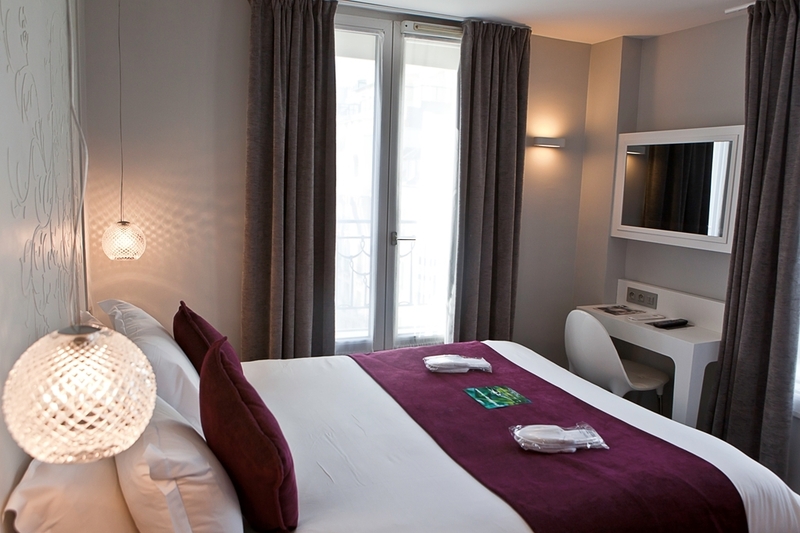 The hotel is perfectly located in the champs elysees of Paris...It's a huge advantage. A lot of attractions are very near. U can see the top of Grand Palais just from the outside of the hotel. The size of the room is not so small (compared to other hotels I have stayed in Europe). The room is clean and quiet. I have found the washroom a bit small .. We have enjoyed our stay a lot. "wouldn't honor pre-paid reservation made over 6 months in advance via amex travel"
We stayed here for 4 nights last week. A nice room. Friendly hotel staff, we were able to check in a little early. The room was small, but what one would expect unless you're paying the big bucks for a suite. Our room was on the corner facing two streets so it was a little noisy with the windows open. The free mini bar was very nice. There's a bakery right across the street, so no need to pay for the hotels breakfast. One block from the worlds most famous avenue. Place is tiny, but that is Paris. Very clean and well kept. Price included complementary mini bar. That was a huge perk considering I drink a lot of water. Beautiful views from the room. I slept with the window open only because I love the fresh air, thus not a loud street. Nice big queen bed. To be honest, we got the deal of a lifetime thanks to Venere.com having a malfunction. Not sure I would of paid more than €150 a night, but that is me as I'm budget cautious. Did not try the breakfast as there was an amazing cafe kitty corner from hotel. Staff was very helpful! Loved the location and the nice room. This hotel was meant to be a nice luxury for the end of our trip so we spent a bit extra. We walk into this small hotel. Smells terrible, staff were not welcoming more like 'here's your key here's your room now piss off'. She didn't even come into the room and explain what how the hotel works like every other hotel we've been too. We stayed in the boudoir suite and was as smaller our rooms in a 3star hotel in central Rome. The bed was two singles pushed together which is normal for Europe but they aren't usually different heights and gap In-between. In each room had a room service booklet which was available between 12pm-12am. Every time we tried to order something which would be around 3pm, they would say that, unfortunately they had sold out for the DAY. Also they say rooms are sound proof. They are not sound proof. We weren't given any extra shampoos or soaps after the first day which you get in every other hotel. Cleaners were rude, and would tell me to take the stairs because they were using the elevator but would leave multiple vacuums and bags lying around the stairs which is a major occupational heath and safety issue. Only good thing about this hotel was location. This hotel is not a 4 star hotel. Quite sad end to our trip. The location of this hotel was fantastic, Just 1 block from Champs Elysee. Rooms were very tiny and expensive but that seems to be the norm in Paris. Overall, quiet , clean and comfortable bed. 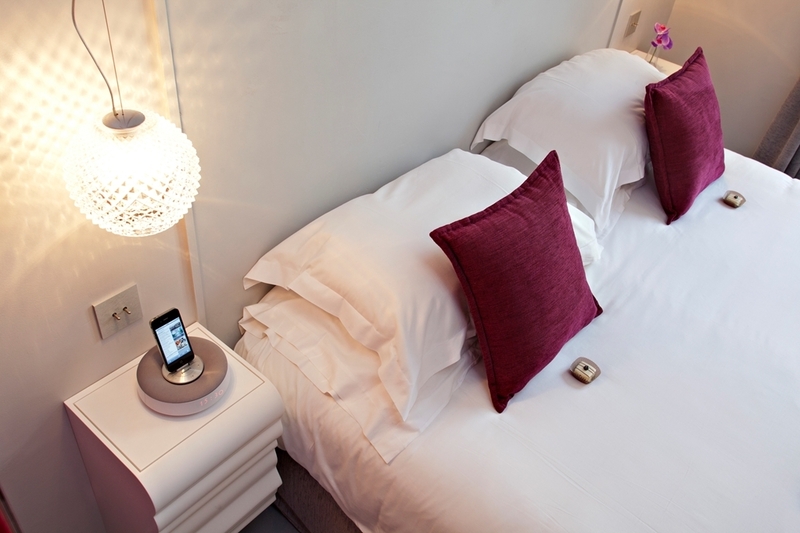 Everything you could ask for in a hotel for a short stay in Paris. I just wish there was a little more space to put our luggage but the room size seems normal for Paris. "Best 18th birthday present "
We booked this hotel as a surprise break away for my daughters 18th birthday present for her & her boyfriend. The hotel staff were amazing & arranged a taxi for them from the train station to the hotel. Both Olivia & Josh said the room was lovely & hotel staff were really nice & even ordered them a dominoes pizza one night? (Teenagers!) Thank you to all the staff for making my daughters 18th extra special. Reception staff Lies provided great service. We arrived at hotel around 9am and was lucky to be able to check in then instead of having to wait till 2pm with luggage storage. This is really great as we wanted to freshen up after a long haul flight before heading out. Another pleasant surprise was the drinks in the bar fridge and snacks in the room were all complimentary and you can replenish them by getting them from the business office area where there is also a desktop with free Internet service. Yet another plus is the bathroom with both a massive rain shower and the usual flexible shower head. Room and bathroom are very clean. Location excellent close walk to metro, champs elysee and relatively quiet and safe surroundings. Plenty of nice restaurants and patisseries just a stones throw away. Everything in Europe is small ... Yes, i know. This hotel was smaller than a hostel though lol. The entrance, the elevator, the right winding staircase and the space in the room were all tiny. The room was newly renovated and very nice. The waterfall shower was awesome. The bed was comfy; however it was very tight. The location to the metro (Franklin Roosevelt stop) and Champ Elysee was superb. Location made it very easy to get around Paris. There were also great eateries in walking distance. The wifi worked very well too. Wow, what a disappointment. First time in Paris from Seattle. My wife and I paid for the entire trip for my parents for their 50th Anniversary. This is what we arrive to. Construction equipment lying around and doors leaning against the walls. Caution tape with no lights in the stairwell. The receptionist just pulled one side of tape down and told us to walk down. Very dangerous. The worst part was after saying that we would get a full refund, they changed their story and said that they were finished before we arrived and that they offered us other rooms. What a big lie. They said they had one other room, we reserved two. Who would stay in a place like this. Good thing I took pictures. Very dishonest. Dear Guest, First of all, we would like to thank you for sharing your recent experience with us. We are sorry to hear that your stay did not match your expectations. It is true that the hotel was undergoing through some renovation work in order to offer to our guest a better experience in our 4* boutique hotel in Paris. We would like to inform you that the renovation work are now finished! All the carpets have been changed and new bed furniture have been installed to improve the comfort of our guests. If you are celebrating some specials events, do not hesitate to tell us before your arrival. We will do our best to do something special for this occasion. Please be assured that the safety and our guest's satisfaction are our main concerns. Best Regards. "Good, but doesn't feel like 4 stars"
The very good location is the most important feature of this hotel, followed by a clean, modern and recently updated rooms with news towels every day. However, as other reviewers express, rooms are quite small - we joked that while room service is available, we wouldn't know where to eat in the room. Also, the breakfast room is really small and the days we used it we were lucky to get a seat (it only seats eight persons). The "reception" is only maybe four square metres so it really doesn't welcome you in a way you would expect from a four star hotel. People working in the reception were nice and helpful, but the maid seemed stressed and was not customer oriented. Finally, we reserved a double-bed and this was confirmed to us; but we got two single beds pushed together which of course is annoying for couples. Stayed at this hotel last year during valentines with my girlfriend. The hotel is very well located and within walking distance on Champs Elysees, which is good for bars, restaurants and shopping. The room was modern, clean and comfortable, with all the facilities you would need. The coffee machine was a nice touch and the complimentary refreshments was a good idea which set the hotel apart from the rest. The breakfast was okay, with everything you would need for a quick snack before going out sightseeing for the day. The hotel staff were friendly and accommodating and if visiting Paris again, I would definitely stay here again. An overall pleasant stay and would recommend. Stayed 2 nights at the hotel which is very close to the Champs Elysée 8eme arrondissement shopping precint. 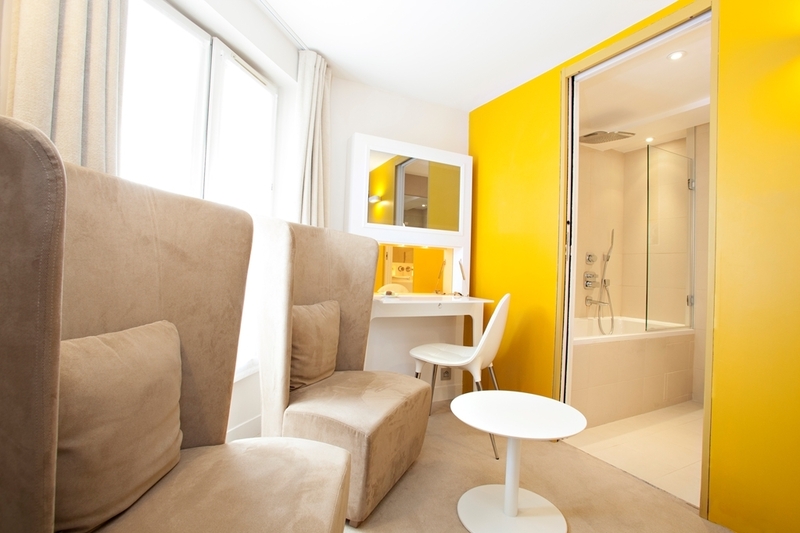 Very nice hotel, clean and good value for money near the Champs Elysée. Staff were very helpful specially Jean Baptiste at reception who helped with booking the Moulin Rouge show and Musée du Louvre. Overall I had a great stay and will definitely recommend the hotel to family and friends. I visited Paris with my boyfriend just a few days ago. 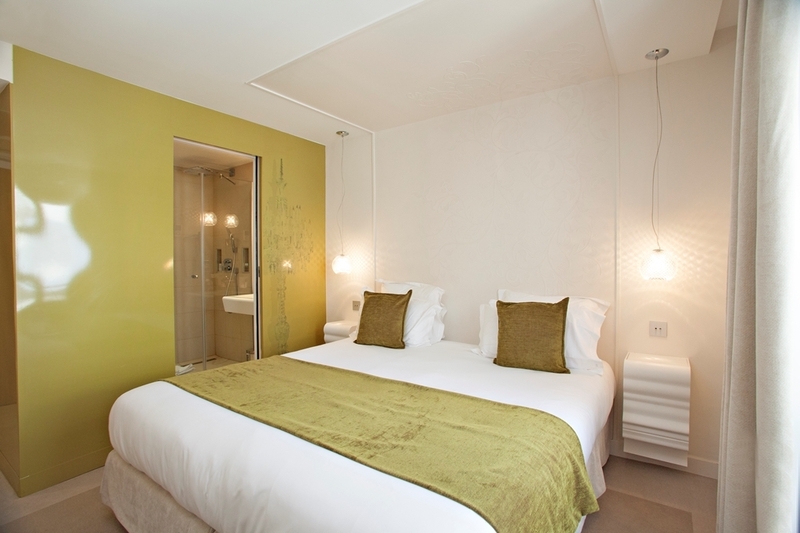 We wanted a hotel that was close to the city center, clean and within our budget . This coquette hotel was the perfect place to spend a couple of nights and we would for sure return in a blink of an eye. The room was very clean, and although quite small, the minibar was updated daily and the towels were also changed every day. The breakfast was very good, with a large variety of things to choose from: from vegan options to meat lovers special :). The personnel was very friendly and helpful! 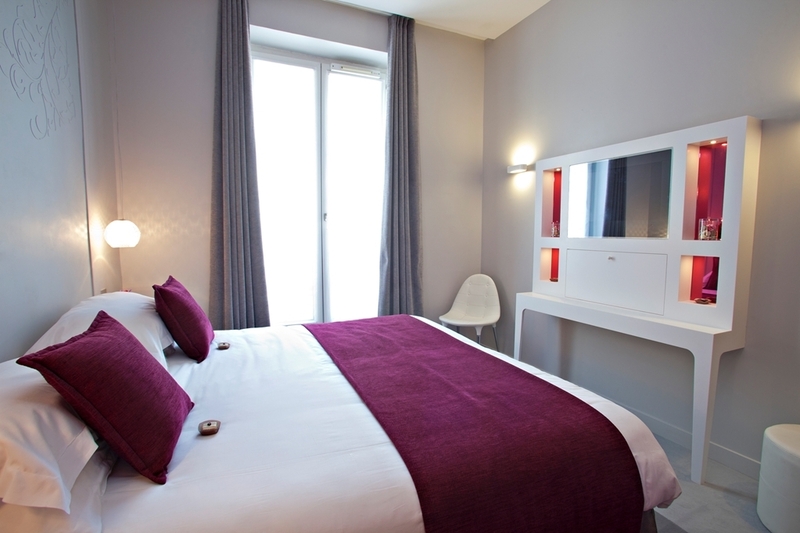 Overall an excellent option for your trip in Paris! The hotel has a great location, it is near to the Paris Metro as well as to several restaurants and fancy shops in Champs Elysee. Thee hotel rooms are sound proof, not too big but they are very cozy, they have a modern decoration, they are very clean and have everything you need to be comfortable in it, private bathroom equipped with clean towels and beauty supplies. Room service is made everyday. Rooms have a coffee machine and a mini bar in your room where you can find free coffee, water, sodas, and Oragina (french orange soda, the best we've ever tried before). The staff is very helpful, specially we are very thankful with Lucille for her attention in our stay. Totally recommended if you are traveling for pleasure. hotel is really small. i found the hotel door hardly . rooms are small too but there was really clean and comfort.staffs was helpful , Just one of them show me and address by mistake!!! hotel location was great. metro access , cham elysses ave. , Louvre museum and other important places near. I must say I am very upset with this hotel. Firstly we got transferred here because of Hotel Beauchamp bad planning. Couldn't accommodate us even though we had paid much earlier. When I checked in, being a nursing mum, I had been expressing breast milk through out the trip so that I can bring back for my baby. And I specifically told them to deep freeze the milk which was what I did in the other hotel at Brussels. When I checked out this morning, all the frozen milk were defrost. And the staff on duty just said it's the fault of their colleague. How convenient! And I had to chuck all my precious milk. 3 days worth of milk!!! No sincere apologies from this hotel either, no point staying in such a hotel even though it's very convenient for their location. I thought how crazy it would be to throw all my carefully planned itineraries and just look for a nice hotel where I can stay for a day or two. Because I trust Best Western hotels to be clean, comfortable and reasonably priced, I booked a room at the Best Western Champs Elysees Secret hotel 10 minutes before I actually checked-in. Unfortunately, the last room has been booked so I was stuck to finding another hotel. I have to highly commend Florian (Hotel Manager) who at the time was already carrying his bag and heading out for the day. He stayed and found a solution to my hotel semi-crisis. He called other BW chains, other hotels nearby, but it was either fully booked or out of my price range. Finally, he called in a favor and got me a really amazing rate (including breakfast) in one of the 5-star hotels, just 5 minutes away by cab. They also secured me a room the following day at their hotel and made sure by stay was very comfortable (I even got a free upgrade!). The room looks almost exactly like the 5-star hotel I stayed at the night before. 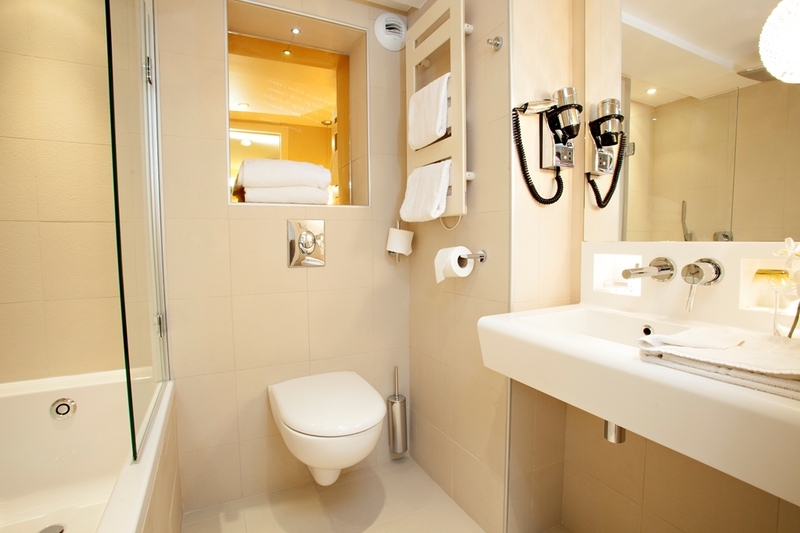 The layout of the room was the same, the bathroom was very clean and coffee/tea facility was also available. The lounge, though small, was a really nice touch. You can go to the mezzanine floor of the hotel where there are juices, soft drinks and coffee available. You can also surf the internet and print for free (I printed my bus ticket from there, so convenient).There's a small lift which was very important and stairs are also available should you have extreme fear of heights like me. There are a lot of restaurants in the area and literally 8 minutes away from the main Champs Elysees street so the location is perfect. The receptionists were extremely helpful to every hotel guest that requests for assistance with...everything! Breakfast came with the rate I got so not sure how much it was. A limited selection of food and beverage, just right for a quick breakfast. Overall, two thumbs up to another Best Western hotel. Amazing staff, location, price. I highly recommend this. Look for Florian, all the time! Dear Des Z , First of all, Thank you for taking the time to share your experience on Tripadvisor! We are so pleased to read that you enjoyed your stay in our Best western Despite this small incident independent of our will. In exceptional cases such as these, we chose to relocate our guests in hotel of high quality because the well being of our customers is our priority. We will not fail to thank our colleagues from the Maison Albar Albar Champs Elysees Mac Mahon for their great assistance and service. 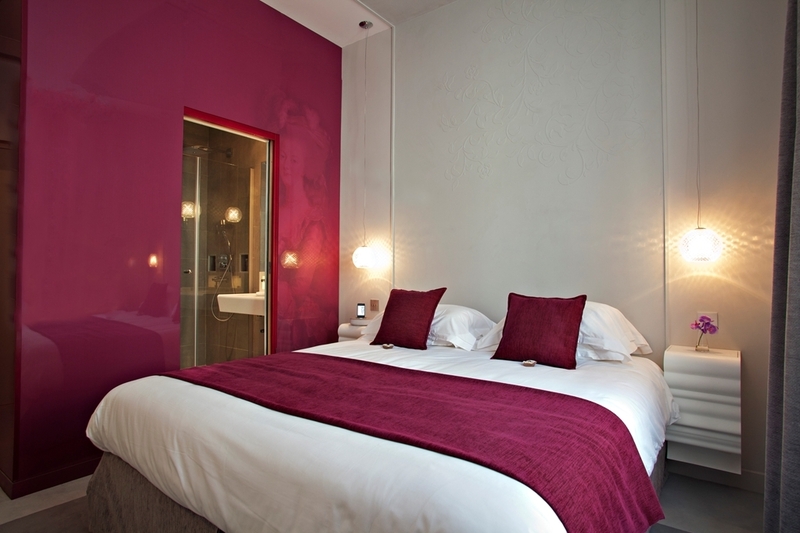 It will be a great pleasure to welcome you during your next stay in Paris Do not hesitate to contact us directly for future bookings by indicating your discount card code got at your checkout. Again all the team of the Best Western Premier Elysée Secret says thank you for this nice comment! "Came to watch the Tour de France so fantastic location." Although the room was a little small, it was lovely and bright with a Juliette Balcony. A very comfortable bed with good quality linen although another pillow would have been nice. A compact bathroom with a great shower. The coffee machine was a bonus. The hotel staff was amicable and professional, the service and clean rooms were outstanding, we also love the area located because it was so close to the most interesting sights of Paris and variety of good restaurants! Our room was small but it's normal in Paris and beside this everything was super!! We definitely recommend this Hotel and we'll come back !! "Conveniently located in Champs Elysees area!" Before I start my review I would recommend that if you have never been to Paris, please read the available blogs and websites on the Internet regarding this city, as everything is not like you might find in other turistic places. The hotel is very well located in the Champs Elysees area, less than 100mts from Franklin D. Roosevelt metro station (best if you exit the metro following "sortie rond point" signs). Although this is a very busy area the hotel is in a parallel street from Champs Elysees, hence during the night the sleep quality is very good, without noise disturbances during the night. The room size was within the parisian standard (small) but they do have available bigger rooms at an extra cost, decoration was nice and the best feature is that they include Nespresso coffee machines in every room and in my fare it was also included the soft drinks from the mini bar. Breakfast was OK, also within the european standards (eggs, bread, cereal, coffee/tea, fruit and juice) and the price of it was below the surrounding restaurants with the same quality and more options, as breaksfast in most cafes in Paris consist only in a piece of bread and coffee. Location is great as you are near a lot of shops and restaurants, and the metro is a good way to move around the touristic places, within walking distance you will find Arc de Triomphe, and a little bit farther Musee du Louvre and Eiffel Tower. Regarding the price, I got a very good fare from the Best Western Website and compared to other hotels in the area I got a very good quality/price ratio. If you do not get a special fare probably the cost might be higher or equal to a higher class hotel. About cleanliness, in general the hotel was ok although the carpet in my room had some stains on it, I don't know how often they do clean them but there was a memo in the elevator stating that all carpets were going to be clean a couple of days later, hopefully they did as I left the hotel before that date. The service was good (in the restaurant and the small breakfast area), although they practically do not have a reception area (only a small desk) they keep someone at it 24hrs willing to help. Remember, it is Paris, some people speaks very little English and a lot does not speak it at all, at the hotel some did speak English, some not. I enjoyed the design of the room, the tea and coffee complimentary! I enjoyed the little balcony on op of the roof and view on the Parisian roofs. The service was excellent. The computer was down and I was not able to use it. Otherwise I appreciated the upgrade. If I have a next stay in this district I will definitely come back in this Hotel Elysee Secret. 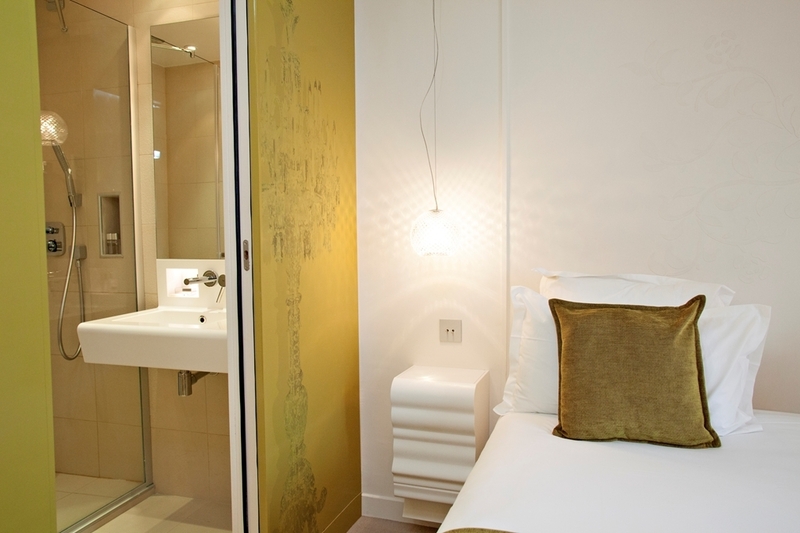 Unassuming very small hotel, great location close to Champs Elysee. 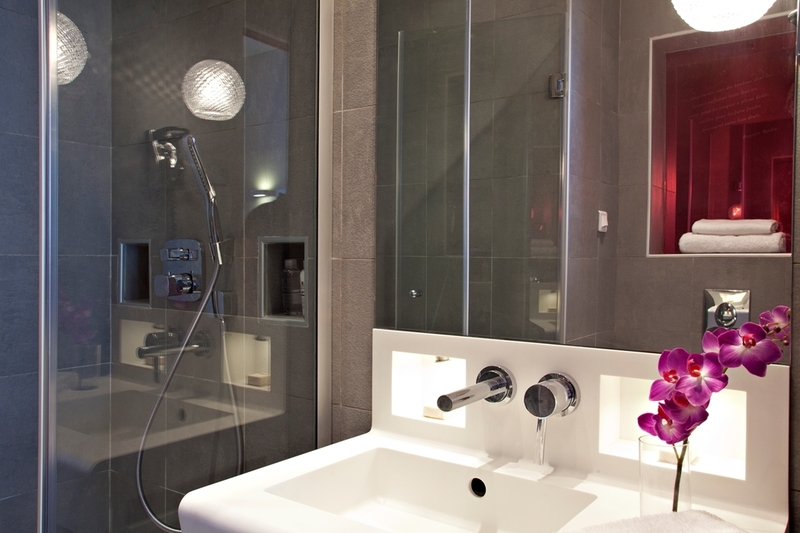 Great little bathroom and shower fantastic, loved mini-bar and coffee maker. Bit cramped for hanging and storage space. However a lot of street noise at night, bars, traffic and dust carts. As it was so warm for time of year we needed the windows open as the A/C wasn't working. We didn't sleep well because of the noise - but there again we are not city dwellers perhaps you become accustomed to the noise. Very caring receptionist helped me print out tickets; I was not familiar with the Apple machine and my French was not good enough to work out the problem. "Poor room, poor dinning room"
The room we got was a "Trianon", even though we did not reserve that room. The bed is in an upper level in the room, so we had to use an internal staircase to get to the bed. We are not young, so it was quite uncomfortable to do this, especially at night. The dinning room was so tiny, we had people waiting over us to finish. No more than 3-4 couples can eat at the same time. The elevator is very small and cannot hold more than 1 person with his luggage. The location is very good, close to "Franklin Roosevelt" metro station.